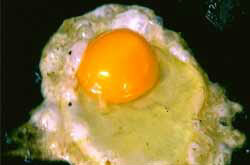 Fried Eggs are whites who try to emulate Asian culture. I’ve ranted quite a bit about why Asians are screwed, so on and so forth. So it might seem at first glance surprising, shocking, or even impossible that there might be white guys that actually want to emulate Asians. These white-guys-who-want-to-be- Asian (hereafter referred to as ‘Fried Eggs’ – white on the outside, yellow on the inside, bad for your heart, and goes straight to your hips) might seem like they’re only following a dead end path. In actuality, though, they’re just another cog in the Giant Machine of Asian Man Screwage. It’s pretty easy to tell a Fried Egg when you meet one. Most of them attempt to appropriate some sort of Asian culture (usually Japanese, sometimes Chinese). However, their knowledge of said culture is woefully limited. If you’ve got the Japanese Fried Egg, you’re dealing with somebody who watches anime and likes sushi. If you’ve got the Chinese Fried Egg, you’re dealing with somebody who takes kung fu lessons. In fact, their knowledge of culture is so limited that it’s insulting for them to even claim they like Japanese culture, when all they know about Japanese culture is Dragonball Z.
That’s not to say that every anime fan is a Fried Egg. I know quite a few very reasonable anime fans. However, for every reasonable anime fan, there is a certifiable Fried Egg nut. These guys are instantly spottable. They’ll usually have some variant of “SSJGoku2941293” as their IM handle or recite “Aku soku zan!” (horribly mispronounced, of course) as if that phrase was some deep saying by Confucius. Some of them may sport kanji shirts or even tattoos, like this guy over here to the right. Fried Eggs usually like kanji because they think it looks cool, or it makes them look more ‘culturally diverse’, whatever the hell that means. 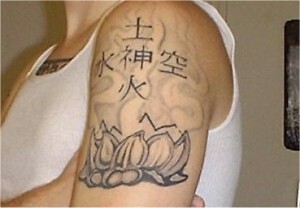 Unfortunately for this guy, his tattoos claim that the four elements are water, fire, earth, and… empty. Sorry! I bet I could make a shirt that says “I am a stupid ignorant foreigner” in Japanese, and Fried Eggs would buy it. Now that we’ve gone over the characteristics of a Fried Egg, it’s time to explain why Fried Eggs also screw Asian Men over. While a Fried Egg is usually a quote-unquote ‘dork’ and therefore is not usually a big competitor for girls (having usually marginalized themselves into the anime or video game communities), this only means they’re not really competition for other white guys. Rather, they compete for the small pool of girls who are into Asian culture. Let’s say you meet a girl in your, oh, Chinese Culture class. You think you’ve got a chance, right? But no! Along comes some white guy who quotes Crouching Tiger, Hidden Dragon, has a tattoo that says “male” on his arm, and whose IM handle is “HimuraKenshinBattousai”. The girl is blinded by the Fried Egg’s so-called ‘cultural diversity’ and ‘understanding of Asian issues’, and once again the Asian guy is left in the dust. It’s a sorry trend, but Fried Eggs are going to get increasingly popular as Asian culture becomes ‘in’, whereas actual Asian people remain ignored. Just like real fried eggs and the Atkins diet, Fried Eggs are being consumed more and more, despite being so bad for you, yet nobody wants to believe it.